I was standing there, watching the waves dance. Hubby and kiddo were playing hide and seek with the waves. Teasing the water to come and touch their feet. At the horizon, the anchored ships had switched the lights on, they were now twinkling like little stars far far away. I decided to let the waves kiss my feet. I wanted to feel the salty, chilling water wash away all my worries. I looked down to watch them come and bury my feet in the sand. Only I couldn’t. My paunch was coming in between. Not one to take a hint easily, I stretched a bit further to see the waves bury my feet. I could still not see my feet, only my paunch was visible. OK, I get the message. Time for some serious measures to watch my weight. No more fatty food. While I ponder over the point, you guys enjoy this great thali, dishes prepared from the state of Bengal. 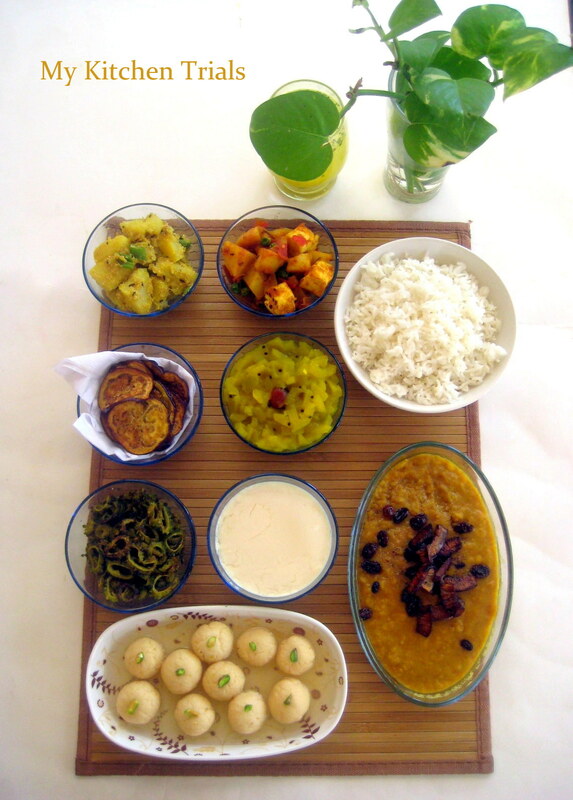 Just like dieting sounds alien to me, Bengali cuisine is also foreign for me. So thanks a ton, Vaishali, for your insight into Bengali food and for helping me design the menu. Without your help, I would have been totally lost! Like Kerala Sadya, Bengali food too has some rules when it comes to the food. 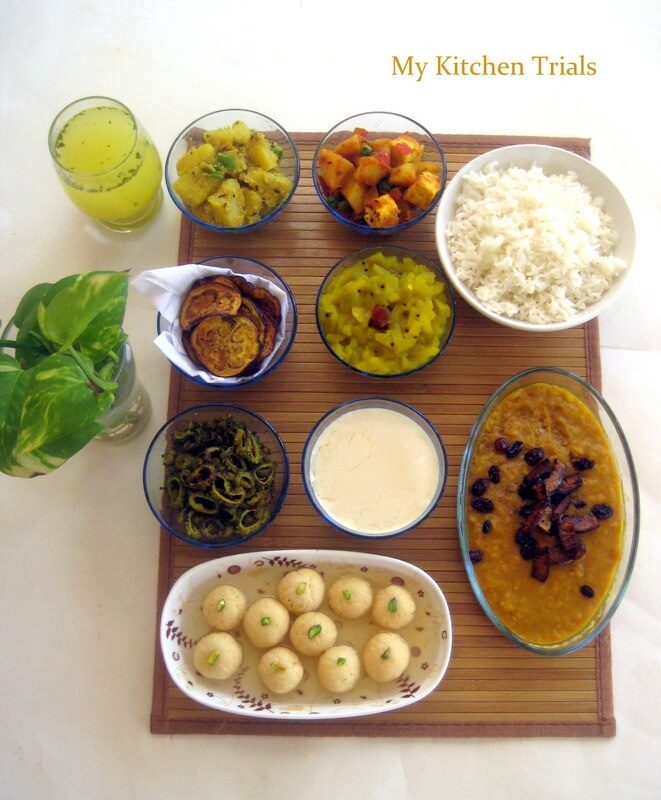 I read about Bengali Cuisine here, written by Sandeepa of Bong Mom’s Cookbook. Rice is the main cereal there, just like in Kerala and Tamil Nadu. The first course has bitter gourd or neem leaves (something bitter) in it, this is supposed to have cleansing properties. 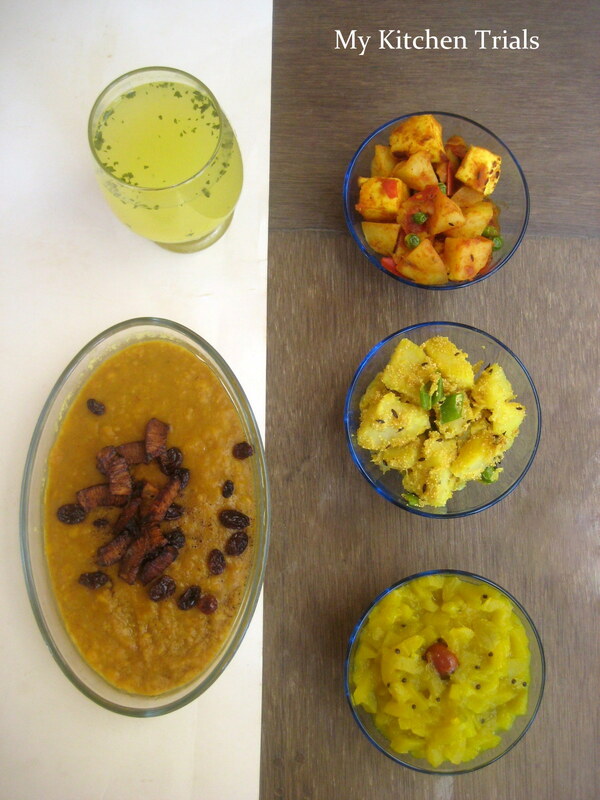 It is followed by rice and dal, with a fried bhaja or any other seasonal vegetable as a side dish. Fish and meat courses follow, but for vegetarian meals, paneer is a common substitute. Then comes the chutney round. I tried getting pineapples, but I was out of luck that day. Went in for a raw mango chutney, and boy! it tasted so good. The last round is yogurt and then some sweet. I made misti doi. I cooked the milk in the pressure cooker and I don’t know what I did wrong, the texture didn’t come out right. The taste was yum, but the texture didn’t come close to even my usual thick yogurt. Just bad luck, I guess. 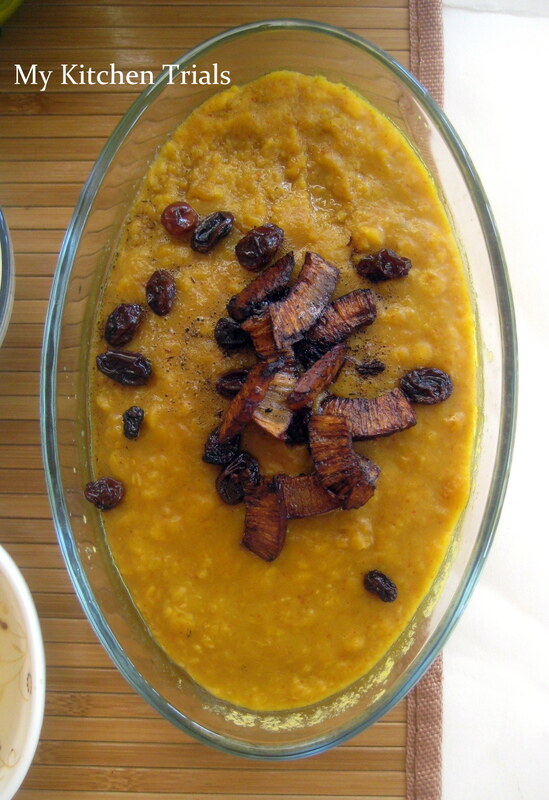 Cholar Dal : Dal made with chana dal, made on festivals and special occasions. 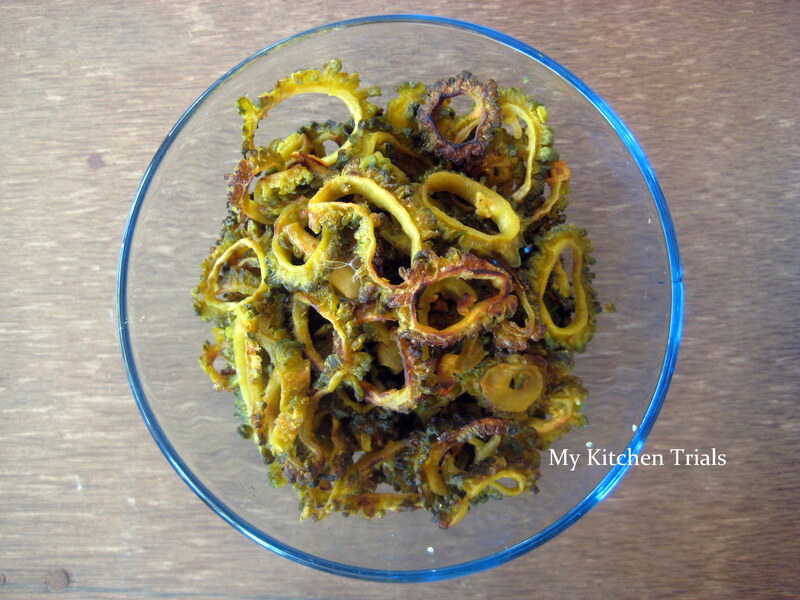 For Ucche Bhaja, bitter gourd fry, substitute brinjal with bitter guard and follow the same recipe. Wash and pat the brinjal dry. Cut into 1/2″ thick round slices. Apply salt and turmeric powder. Heat oil in a pan. Deep fry brinjal until crisp and brown on both sides. Drain on a paper towel and serve hot. I have cut mine too thin. It should be a little more thick. Except for the rasgolla and the dal, I am making everything for the first time. I hope I have done it right. This is a first time Bengali thali for me and I really loved the food. 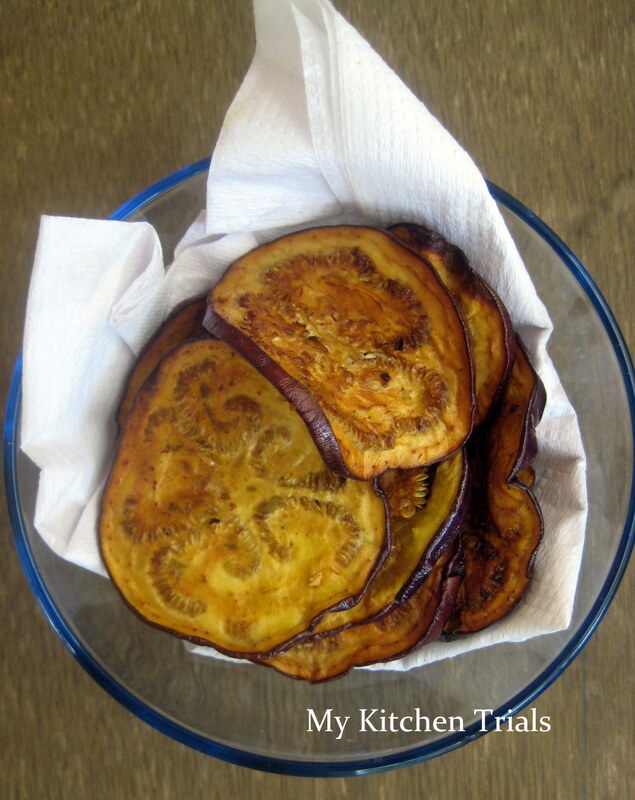 Who thought eggplants would be so tasty when fried with salt and a pinch of turmeric?! Water or Soda for serving : 4-5 cups, again need to taste test and adjust accordingly. The first step is to get the mango pulp. Then for serving, the pulp can be diluted with water or with soda. Wash, clean and pat the mangoes dry. Roast them directly in open flame (like how we do for Baingan bhaja) or I guess you can bake them until they are soft as well. Turn the mangoes with a pair of tongs cook both sides. Once the skin is black and blistered, keep aside to cool. Once its cool to handle, peel the charred skin off. Wash thoroughly so that there are no burnt pieces left and squeeze the pulp out. Collect it in a bowl. Add sugar and a pinch of salt and handful of washed mint leaves (optional) and blend in a mixer/blender. This is the concentrate. I finished off mine then itself , so never really got around storing it. Add 3-4 cups of water and blend again. Check the sugar and add more if required. The quantity of water and sugar will depend on the sourness of mangoes. So start with a lesser quantity and work your way upwards. Pour into tall glasses and serve cool with ice cubes. Cool Thali. I still don’t understand how you all work on so many dishes for thali. Great job. I made the thali only for two plus kiddo, so the amount of food you see in the picture is what I have prepared (almost). So it wasn’t that tough. Impressive Thali. Again I repeat, you have put in lots of effort Rajani. Wow,wat a spread again,omg mindblowing Rajani..Great efforts..Am speechless.. Awesome job!! The spread is just too yummy. Looks absolutely fantastic. The pictures are awesome and I’m just glued to the screen and took a while to scroll down. My eyes just had a perfect feast. Looks awesome and your efforts are totally visible. Good job Rajani. 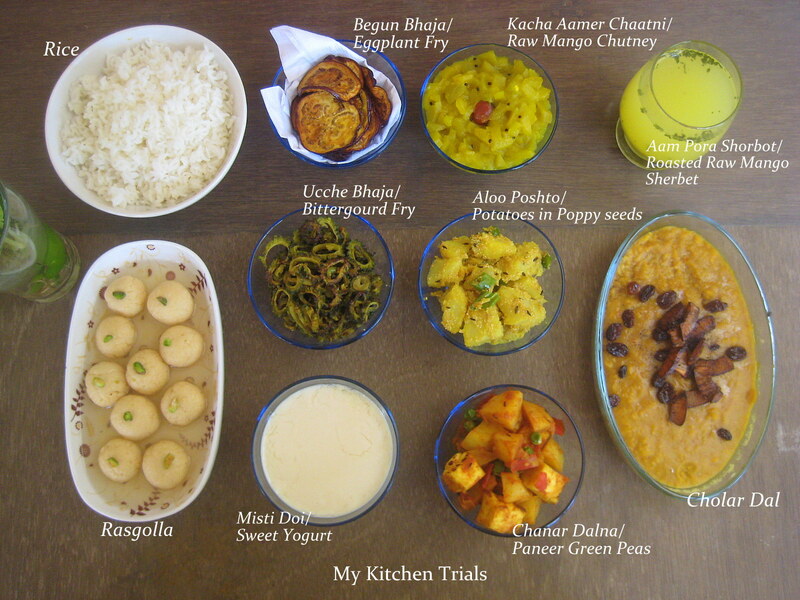 very well done Rajani…love the look of the spread..I am so glad you tried this one..I actually wanted to do it myself in the first week..but somehow seven thali’s were ready and so …anyway the bitter gourd looks perfect and I am sure tasted perfect too! 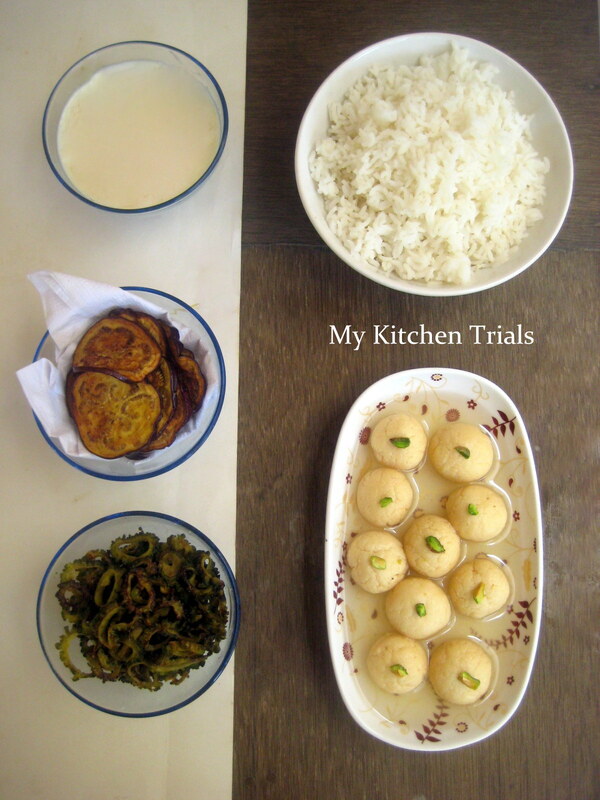 !..Frying Brinjals is an art in itself…Sindhi’s usually make these in regular course and till date mine soak up lot of oil if not done smartly.The daal,Rasgullas…the drink..all need to be complemented!! and Rajani for sure you would have done a equally good job without me..its just that friends r a moral support..
Well done…the thali looks amazing and inviting. Beautiful Thali. Excellent job. Lovely pictures. That is one amazing thali! Drooling at the sweets!